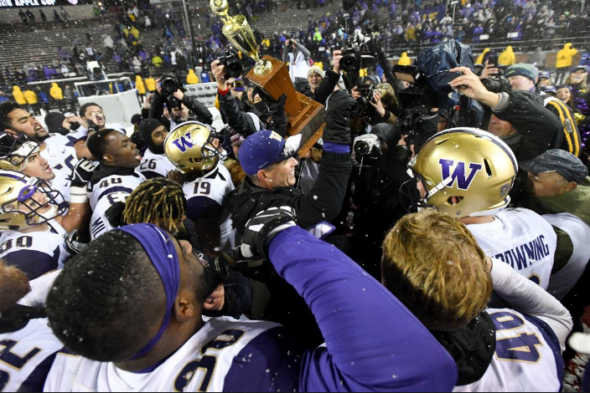 If you thought the 2018 Apple Cup was enhanced because the teams were good and the outcome was nationally relevant -- and hugely entertaining because of snow -- you might want get on your giddy early for the 2019 chapter. 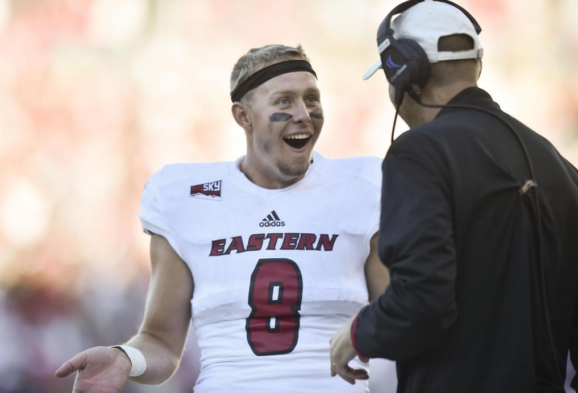 Former Eastern Washington University star QB Gage Gubrud won his NCAA appeal Saturday for an additional year of eligibility and will spend his final season as a graduate transfer at Washington State. College football recruiting for most schools and fans is like ordering from a menu written in Chinese. Pictures are helpful, and previous experiences of random selections generally turned out all right, even if it was never clear what was being eaten. For many recruits, however, the analogy is the chef from Seinfeld. For reasons often not clear, they are surprised with a harsh denial: "No soup for you!" More on this later. The most unheralded, yet best annual event in Seattle sports went off so well Thursday it prompted a tough, square-built retired cop to get all gushy. "An outstanding deal," said Garth Gaines. "It's been fantastic -- the Washington Athletic Club is a great place in a great location. "And the award is very meaningful -- voted on by opposing players. That's the cherry on top. Not a popularity contest. It's how you played." PASADENA, CA. 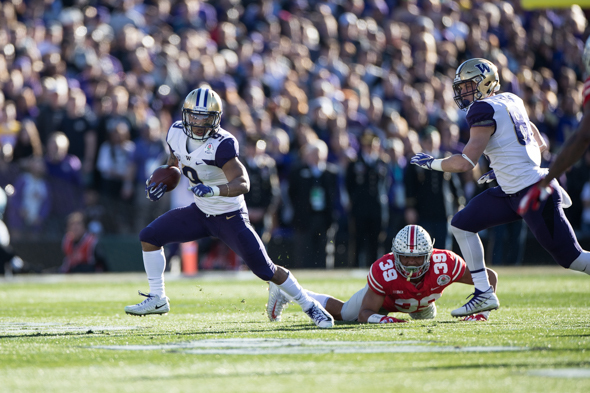 -- It's not fair to say the Washington Huskies came all the way across an 18-year void for naught. 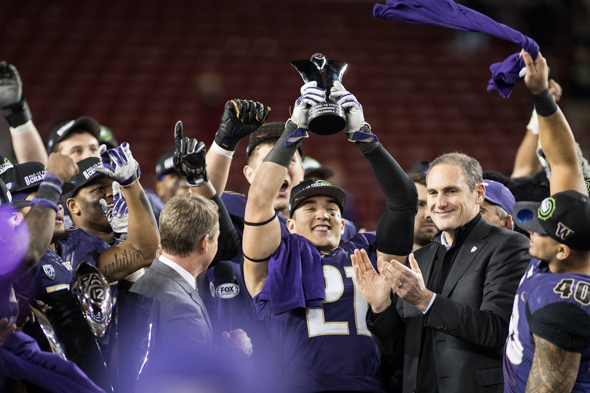 But it is fair to say that that the Pac-12 Conference champions came away with little from the Rose Bowl Tuesday afternoon, because they showed up with neither plan nor purpose sufficient for such a large occasion. PASADENA, CA. 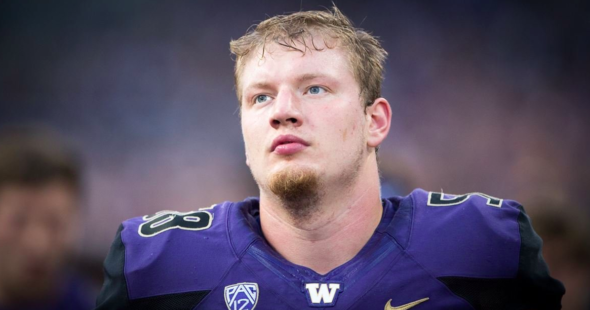 -- Truth be told, Kaleb McGary didn't want to be an offensive lineman. Nor was he wild about going to college in the ginormous city of Seattle, where there was way too much concrete for his country-boy tastes. A better fit seemed to be the University of Wisconsin in small-town Madison, where every third mammal in the state was a cow. 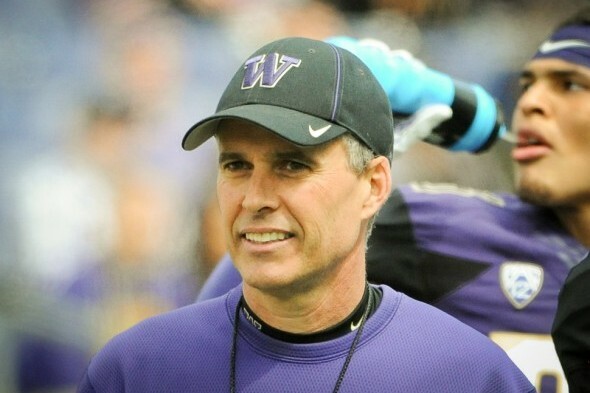 Rod Jones, a member of the 1984 Orange Bowl team who held the Washington career record for catches by a tight end, and more recently was the Huskies' academic coordinator, died Saturday at 54 by suicide from a self-inflicted gunshot wound. Traditionalists are firing up their RVs -- Big 10 Conference champion Ohio State vs. Pac-12 Conference in Pasadena at 2 p.m. New Year's Day in the Rose Bowl. Let the caravan shortly begin heading south on I-5. Confirming: The Rose Bowl is obligated to take the winner of Friday night's Pac-12 Championship. The news is important in case you were among the witnesses whose cringes were so severe that vision was impaired, and you walked away seeking medical attention. Um . . . I'm not feeling it. You know, the big regional sports championship Friday night. 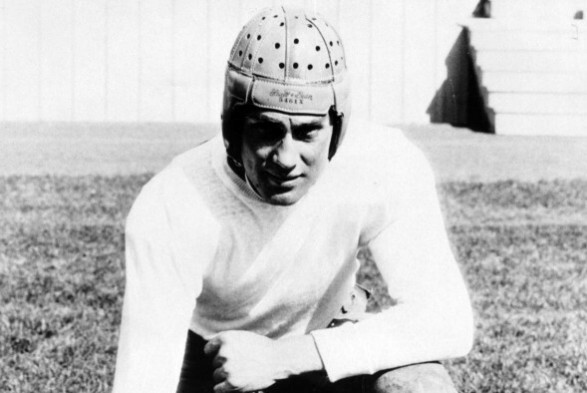 In Santa Clara. Washington Huskies vs. Utah Utes. Winner of the Pac-12 title game goes to the Rose Bowl. Are you feeling it? Didn't think so. After one of best seasons for a linebacker in Huskies football history, Washington senior Ben Burr-Kirven was named Wednesday as Pac-12 Conference Scholar-Athlete of the Year for the 2018 season. He's the second Husky to win the honor in the past three seasons. Former OL Jake Eldrekamp won in 2016. 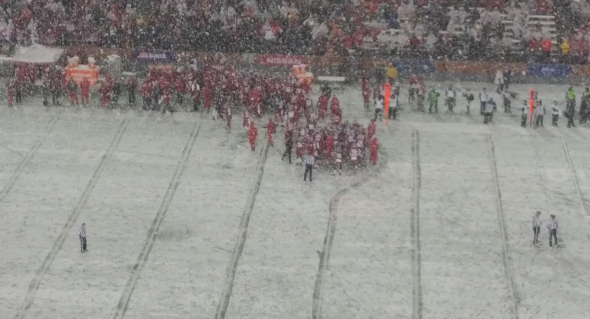 The Cougars' home loss to Washington Friday in the Apple Cup cost more than dignity and the North Division title. In the College Football Rankings released Tuesday, the Cougars fell from eighth to 13th, or one spot beyond where the New Year's Six bowls tend to feed. PULLMAN -- For all of Mike Leach's coaching acumen, in four years he's never figured out what to do about RB Myles Gaskin. And for five years, he hasn't figured out what to do about coach Chris Petersen. 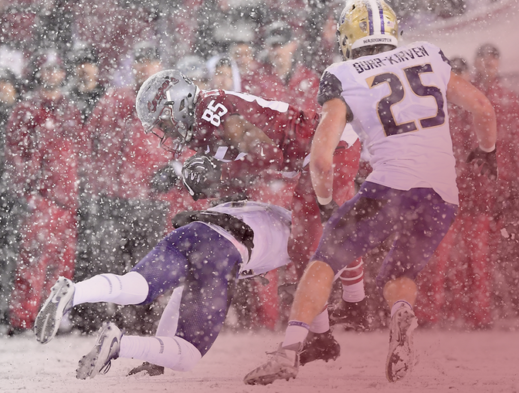 Even after receiving simultaneous visits from the Palouse football imps -- snow, cold, dark and wind, all at once -- he still can't change the Cougars' fate against the Washington Huskies. PULLMAN -- Following the crash of a bus Thursday night on the way to Pullman that temporarily hospitalized 47 members, the University of Washington band didn't continue to the Apple Cup Friday. Ambulances transported the passengers to nearly hospitals, where none of the injuries were considered serious. The Apple Cup, a college football game held following Thanksgiving with its decidedly Northwest theme, compels normal people to dress up in garish crimson or purple fashion ensembles, drive 300 miles through dubious mountain-pass conditions to a designated stadium and sit in cold, rain, snow and darkness to watch the spectacle play out. 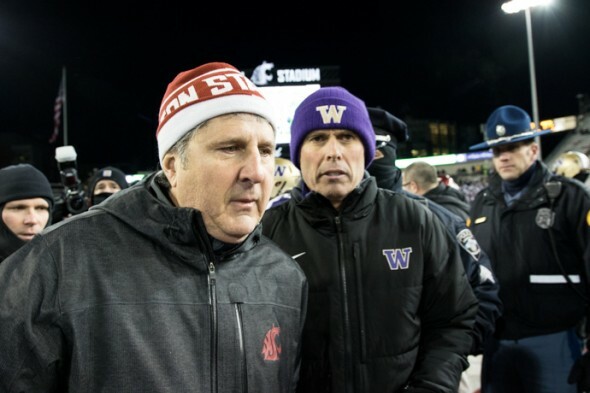 You may think that Friday's Apple Cup is a big game for both Washington and Washington State, given the traditional bragging rights, the unusual West Coast football stakes for each program, and even a national discussion surrounding the Cougars' distant shot at a berth in the College Football Playoffs. While all of that is true, there is potentially a more lasting consequence for Wazzu. Reporters who helicopter, or wagon-train, into Pullman for one-off interviews invariably find Mike Leach amusing, irreverent, original and iconoclastic, especially for his industry. 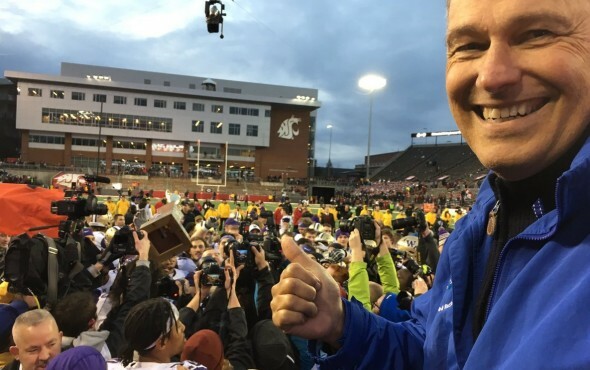 However, reporters who deal with the Washington State football on a regular basis often find him circumspect, contentious and surly. And, often, late. In the final Husky Stadium game of the season, the Washington football team said goodbye to 23 of coach Chris Petersen’s earliest and most accomplished recruits, hello to elite LT Trey Adams and slammed the door in Oregon State’s face. The pregame senior ceremony lasted far longer than any suspense over the outcome. So did Adams’ welcome return from injury purgatory. 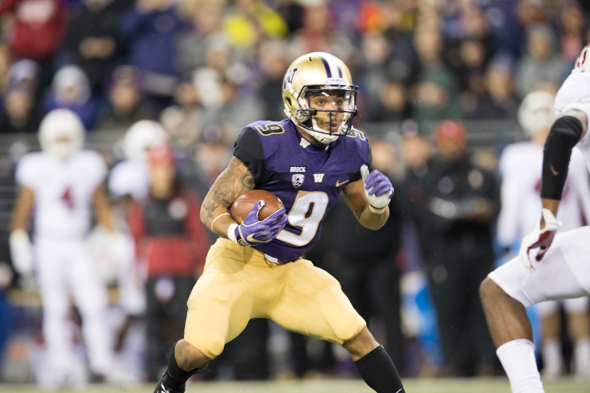 Washington's 27-23 survival win over Stanford Saturday night at Husky Stadium vaulted the Huskies (7-3, 5-2) back into the latest Associated Press college football poll Sunday at 20th, a week after a 12-10 loss at Cal dropped them from the top 25. Washington State (8-1, 5-1), following a 19-13 win over Cal at Pullman, stayed put at No. 10. The Cougars were eighth in the first College Football Playoffs rankings released last week. 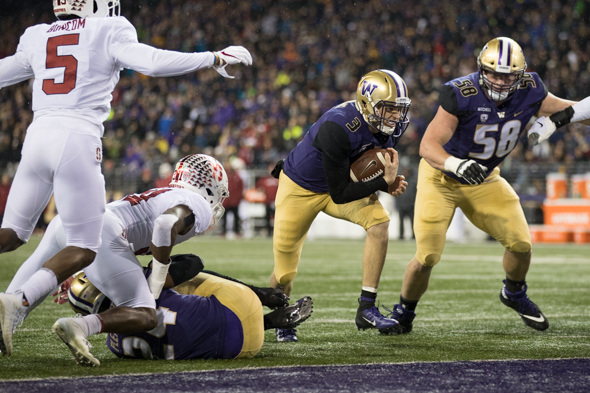 The cold wind off Lake Washington Saturday night was no match for the heat coming from Jake Browning. 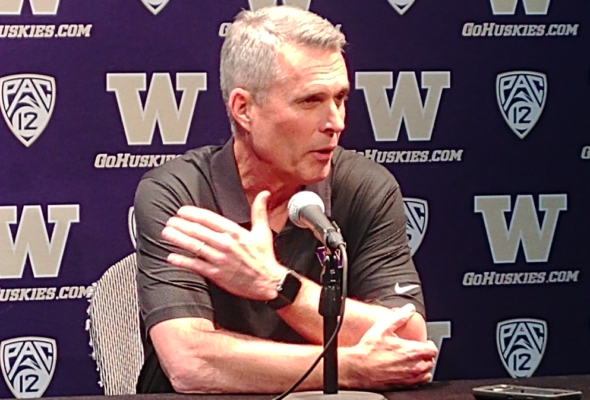 Furious over a benching for two series in an upset loss at Cal a week earlier, Browning turned his anger into two of the best drives of Washington's season. 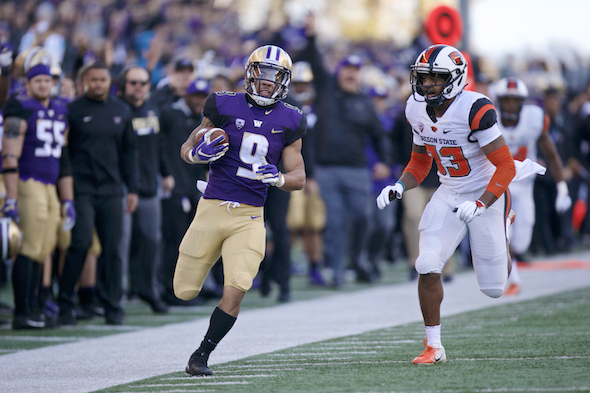 But after the adrenaline that powered a 21-0 halftime lead dwindled, the Huskies found themselves hanging on for dear life against relentless Stanford that, for want of an extra point, probably would have prevailed. The season's first College Football Playoff rankings are out and, to the astonishment of the known sports world, the Washington State Cougars are eighth. WSU at 7-1 has its highest ranking ever in the five-year history of the format, produced by a selection committee.